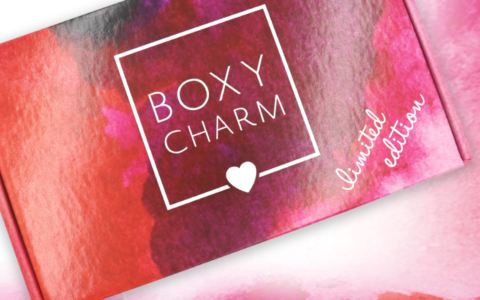 Love with Food is a monthly snack and food sampling subscription box. 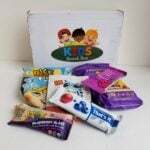 They send only natural and organic snacks and donate a meal to charity for each box sold. 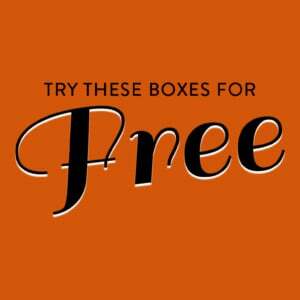 They offer a smaller Tasting Box with 8+ snacks for $9.99 per month, a Deluxe Box with 16-20 snacks for $19.95 per month, and a Gluten-free Box with 10-15 gluten-free snacks for $24.99 per month. This review is of the Deluxe, $19.95 a month, box. The Cost: $19.95 a month + free US shipping. Save with longer subscriptions. The Products: 16-20 snacks that are organic, natural, and/or free from artificial ingredients. The box came with this information card. I miss the old information cards that said more about the snacks. Sometimes there are coupons and/or product literature, as well. Love With Food also included a coupon for Hello Fresh. Check out all of our Hello Fresh reviews to learn more and save $30 off your first box! I did manage to find one intact cookie for a photo, but these were mostly smashed to bits, which is too bad because they did seem to taste good and have a lovely, crumbly texture (maybe too crumbly?). When I was a kid, things would be called “plain” instead of “sea salt” flavor. And these are pretty plain. Before receiving these, I was not much of a fan of dry roasted edamame, and I found these to be quite similar to other ones I’ve tried in terms of texture and flavor. I’d probably like these better if they were dusted with some spices or something. I associate this brand with meat, but this is a new product from them that is vegetarian (not vegan, though, and these really getting pushed in grocery stores around where I live). They have a texture rather similar to the RxBars, probably due to the egg whites. They were tasty but I found them too chewy/sticky by my standards. I just can’t get into this half-popped popcorn trend. I strongly prefer regular popcorn – it’s not as hard on my teeth. Anyway, this is pretty much like eating plain popcorn, only the texture is harder. I am so used to those raw coconut cookies that this was a bit of a surprise. It was chewy and didn’t fall apart when I bit into it. I like coconut so I was happy to see this. Anyway, this is gluten free but not vegan (has egg whites). I don’t know if this brand makes anything else but I’d be happy to see them again in a future box. These are weird little snacks that we get regularly in this box. They are little dots of dried mango sticking to strips of paper. They are SOOOO sticky, I am afraid I am going to pull off some of my Invisalign attachments when I try to eat them. I do like the flavor, though. I usually buy the 8-packs of instant oatmeal for about $3 so I object to paying almost $3 per package, though you do get a volume discount with these. The flavor here was mild. The fill line was too high for me (meaning, I followed the directions for preparing this and it was way too soupy for my taste). I’d suggest starting with less water because you can always add more, but you can’t really get rid of water once it’s in there. Also, there is a decent chance that the probiotics in this didn’t agree with me. I did not feel good the evening after I ate this and it was a similar feeling as when I’ve had issues with other probiotic products in the past. So do use caution if you don’t always have good luck with probiotics. You’ll get potato chips fairly often with this subscription. Sometimes they are new brands for me but sometimes they are brands, like this one, that I’ve seen in local stores. At any rate, salt and vinegar is not exactly my favorite chip flavor (mostly because of the vinegar) but I was craving potato chips so I made it work. This brand is a grocery store mainstay. These are fine, but as a personal preference, I prefer thinner pretzels if they are going to be this hard kind. I thought I could vaguely detect a sourdough flavor, which added some interest as well. I was a little worried about this at first – I didn’t want to eat something that tasted both like sesame AND like vanilla. But the sesame flavor really wasn’t apparent and I mostly got vanilla out of this. It was very crumbly but actually, I liked the texture, it had a “melt in your mouth” quality to it that I enjoyed. These are low in fat and honestly kind of high in sugar and other carbohydrates. This is the problem with plant-based protein bars – they include things like pea protein that come accompanied with a lot of starch, and don’t have the best flavor on their own. These felt like a mix among granola bars, energy bars, and protein bars, with a little bit of Rice Krispie Treat thrown in. (Yes, one of them came open in the box, but the box was shrink-wrapped and both bars looked the same so I let it go rather than requesting a replacement. This is basically a cookie. As you can see from the third image, the chocolate drizzle melted a bit. Which you would expect from something placed in a black mailbox in Georgia when the weather is above 80 degrees. This doesn’t have real marshmallows in it so it is vegetarian (marshmallows typically have gelatin, but this just has little white marshmallow-flavored bits). I enjoyed this well enough although I’m not sure I liked it so much that I’d go out and buy more of them. I’ll hand it to the folks at Zego, this has a better texture than most bars with obviously this much chia in them. Like it’s not hard and crunchy but rather a little sticky and chewy (and a bit tart from the raspberry). This is a new product for me. Verdict: There were 15 items in the September 2018 Love with Food Deluxe Box, counting doubles separately. I appreciated that there wasn’t nearly as much kid-oriented food this month, although I wish the cookies had survived the trip and I’m kind of over the “You Love Fruit” stuff, having received it 3 or 4 times in the past. I think the popcorn was a highlight and the tahini bar was a pleasant surprise. Can you still get this box if you sign up today? No, you will receive the October box. Boxes ship around the 10th of each month. Value Breakdown: This box costs $19.95 + free shipping, which means that each of the 15 items in the box has an average cost of $1.33. What do you think of the September 2018 Love with Food Deluxe Box? What’s your favorite snack subscription?